Sherman Oaks is an 8.1-square-mile (21 km2) district in the San Fernando Valley area of the city of Los Angeles, California. In contrast to much of the Valley, the area is relatively urbanized, with commercial skyscrapers along Ventura Boulevard as well as scattered throughout. In addition, residential densities are highly mixed, with apartment and condominium neighborhoods alongside single-story residential ones. The area is a local hub for regional transportation, business, and shopping. 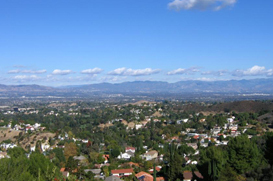 Studio City is an affluent seven-square-mile district in the San Fernando Valley region of the city of Los Angeles, California, United States. It is bounded roughly by Ethel or Longridge Avenues to the west, Highway 101 or Whipple Street to the north, Lankershim Boulevard to the east, and Mulholland Drive to the south. Located in Studio City is Tujunga Village, a charming one-block stretch between Moorpark St. and Woodbridge St. lined on both sides by sidewalk-seating and award-winning restaurants, cafes, a gelato bar, stylish vintage boutiques and a small theater. Studio City was created by the movie industry and given its name in the 1920s when Mack Sennett moved his studios from then Edendale (near modern Echo Park) to a property near Colfax Avenue and Ventura Boulevard. His soundstages, Mack Sennett Studios, were later renamed Mascot Pictures Studios, Republic Pictures Studios, MTM Enterprises Studios, and today are known as the CBS Radford Studios. In 1935, Republic Pictures attracted such stars as Bette Davis, Ronald Reagan, Tony Curtis, James Stewart, Ray Milland, Jack Webb, John Wayne, Errol Flynn, Roy Rogers, and Alfred Hitchcock.